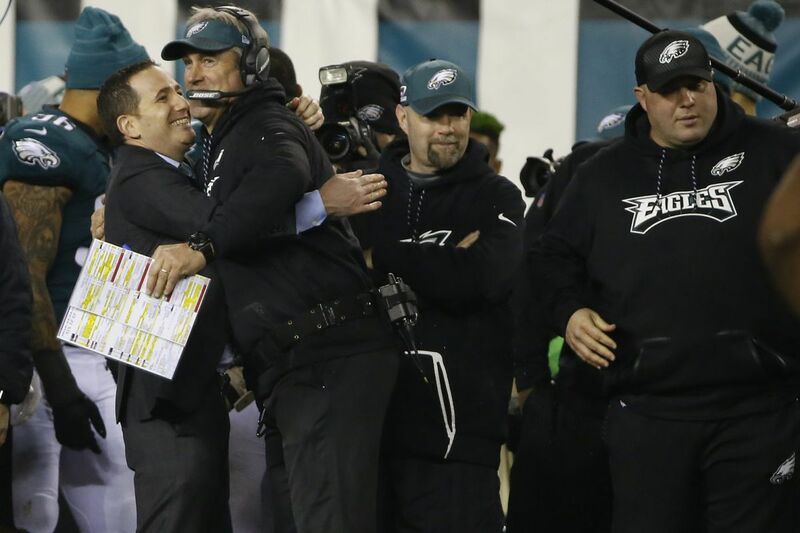 Howie Roseman and Coach Doug Pederson with 45 seconds left on the clock at the end of the fourth quarter of the NFC Championship game between the Philadelphia Eagles and the Minnesota Vikings, Sunday, Jan. 21, 2018, in Philadelphia. The seeds for the Eagles' Super Bowl run were sowed years ago. Like most teams, you can look back almost a decade to its origins. But in the NFL, where yearly turnover is typically the norm, there is always the opportunity to alter your roster significantly in one year. The virtuosity of Howie Roseman's 2017 offseason was that he added short-term pieces without sacrificing the long term. Every one of his free-agent or traded-for acquisitions were successes. And in the Eagles' biggest game of the season — thus far — one after the other made game-changing plays. Nick Foles, Chris Long, Patrick Robinson, LeGarrette Blount, Alshon Jeffery, Derek Barnett, Jay Ajayi, Torrey Smith, Ronald Darby, Tim Jernigan, Corey Graham, Jake Elliott — 12 months ago, not one of them was a glint in Eagles' eye. All will now be forever linked to the franchise after Sunday's remarkable 38-7 drubbing of the Vikings in the NFC championship at Lincoln Financial Field. The Eagles are going to Super Bowl LII to face the New England Patriots — the standard-bearers for franchise sustainability — and Roseman, who has as much authority over his team as any NFL executive, deserves as much credit as anyone. "No. 1, he's a very, very smart guy," owner Jeffrey Lurie said. "In the role today, to be in charge of football operations, it is so much more than simply what it's been in the past decades with scouting. Scouting's a big part of it, but you got to, in so many ways, manage short-term needs, mid-term needs, long-term needs." When the executive vice president of football operations was placed back in charge of personnel two years ago — following a Chip Kelly-fueled one-year hiatus — there were legitimate questions about accountability. The Eagles, after all, had failed to win a playoff game during his previous reign as general manager. But if Roseman is to shoulder some of the blame for the dry spell, he must go to the top of the list of those who warrant praise for the Eagles' return to prominence. The Pro Football Writers' Association named him Executive of the Year last week, and evidence to his expertise was evident throughout the title game. Minnesota Vikings offensive coordinator Pat Shurmur (center) talks to Eagles tight end Brent Celek and Eagles executive vice president of football operations Howie Roseman during warm-ups on Sunday. Roseman and lieutenant Joe Douglas, another of his winning additions, built a roster that was so talented and so deep, it could reach the Super Bowl without its franchise quarterback. Carson Wentz wasn't just the starter, he was arguably the most valuable player of the entire league. It boggles the mind. No matter what happens in two weeks in Minneapolis, the Eagles are built for the long haul. They are equipped to follow the Patriots' blueprint for sustainability. But nothing is guaranteed in the NFL. The Eagles need to strike when the iron is hot. "We found ourselves in an interesting situation where this is Year 2 you could say of the plan, right, but we have a quarterback that was advancing by leaps and bounds and a team that was playing great defense and an offensive line that was really good," Lurie said. "And we thought, 'You know, why can't we win it all?' And we took an approach where we were going to do everything possible that could help our team this year, and, at the same time, not relinquish any options going forward." Bill Belichick and Tom Brady are as formidable as head coach-quarterback pairings go. But they are beatable. The Jaguars nearly upset the Patriots on Sunday in the AFC championship game, but Jacksonville coach Doug Marrone took his foot off the accelerator, and Brady made him pay in a 24-20 comeback victory. Doug Pederson showed no such mercy. Up, 21-7, with 29 seconds left in the first half, the Eagles coach didn't kneel on the ball and head into break as the Jaguars did. He had Foles throw downfield, and his aggressiveness paid off as the Eagles tacked on a field goal. Pederson as coach, it should be noted, was also partly Roseman's doing. The entire first half was a highlight reel for Roseman's offseason acquisitions. Trailing, 7-0, with the early momentum in Minnesota's favor, the Eagles had the Vikings offense in third-and-8. Long rushed off the left edge, turned the corner on right tackle Rashod Hill, and hit quarterback Case Keenum under his right arm. The ball wobbled in the air to Robinson, who returned the interception 50 yards for a touchdown. Back in March, Long and Robinson were signed to one-year deals on the same day. They couldn't have been more different — Long was coming off a championship with the Patriots and the injury-marred Robinson was seemingly on his way out of league. But Roseman saw something in both — in Long, an edge rusher tailor-made for the Eagles' aggressive 4-3 scheme, and in Robinson, a cornerback who simply needed to get healthy. A drive later, Blount bolted downhill, running over safety Andrew Sendejo, for an 11-yard touchdown. The barrel-chested running back was also a Patriot last season and free to walk into free agency. He turned out to be the north-to-south runner the Eagles needed after Ryan Mathews was released. The Vikings had some second-quarter hope as they drove into the red zone, down, 14-7. But Barnett strip-sacked Case Keenum and forced a fumble that Long recovered. The only way the defensive end's sack would have been sweeter was if it came at the expense of Sam Bradford. The Eagles, after all, drafted Barnett with the first-round pick the Vikings parted with in exchange for the quarterback. On the Eagles' ensuing drive, Foles hit Jeffery for a 53-yard touchdown strike. The wide receiver might have had a quiet last month without Wentz, but he came up large on Sunday. Jeffery added another touchdown in the second half. Smith has had an up-and-down season. He's dropped more passes than any other Eagles receiver and should have probably caught a deep toss from Foles in the first quarter. But he rebounded with a spectacular 41-yard grab in the third quarter. Smith might not return next season, but he and Jeffery helped upgrade a position that was severely lacking in 2016. The addition of Ajayi just before the trade deadline could have threatened the balance in the backfield. But Pederson eased him into the rotation and never abandoned Blount. Ajayi finished with 99 all-purpose yards on Sunday. Roseman, truth be told, won the Executive of the Year award mostly because of his maneuvers to get Wentz during the 2016 offseason. It was a bold stroke of moves that most executives wouldn't have had the audacity to pull off. But he did, and the Eagles are in position to be a dominant force for the next decade. But Roseman's run since his return from an embarrassing demotion has been nothing short of impressive. He has kept mostly quiet this season. The Eagles' approach over the last two seasons has been for Pederson to talk for the team in-season and Roseman during the offseason. The executive will be obligated to talk with reporters in Minneapolis next week, but in the celebratory home locker room at Lincoln Financial Field, Roseman didn't take the opportunity to pound his chest when a reporter asked for an interview. "It's the players' and the coaches' day," he said. Roseman's now one win from doing what many "football guys" hadn't given the former business-side executive a chance to pull off — winning a Super Bowl.